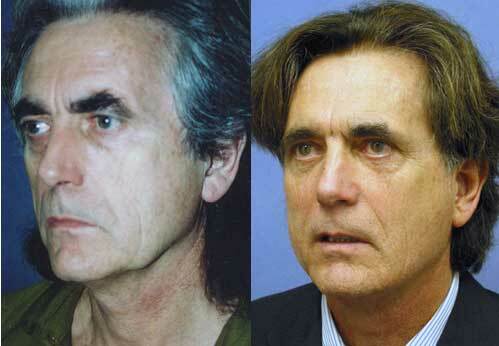 Male facelift necklift in Los Angeles by Aaron Stone MD creates a more youthful looking man. A face-lift neck lift plastic surgery is an operation that elevates and redrapes the facial skin and muscles to eliminate laxity and sagging via incisions around the ears. Time and gravity take their toll. Tissues lose their youthful tone and sag. A face-lift can’t stop this aging process. What it can do is “set back the clock,” improving the most visible signs of aging by removing excess fat, tightening underlying muscles, and redraping the skin of your face and neck, thereby removing jowls and tightening a flabby neck or turkey neck. A facelift – necklift can be done alone, or in conjunction with other procedures such as a forehead lift, eyelid surgery, or nose reshaping. The procedure does not address fine aging lines on the lips or cheeks which are more effectively treated with botox, chemical peel, dermabrasion or laser resurfacing. It does however diminish nasolabial folds or laugh lines as can be seen in my patients’ photos. The subperiosteal facelift is a more aggressive lift that separates the facial muscles from the bones and raises them to a higher level where they reattach. It is particularly effective in shortening the aged elongated upper lip. This male patient had a facelift necklift with forehead lift and upper and lower eyelid blepharoplasties, cosmetic eyelid surgery. Specific problems that need to be accounted for in facelift for men as opposed to women in performing a facelift are receding hairlines, the greater visibility of scars around the ears and the presence of facial hair. In this case a forehead lift was performed by excising skin between the naturally occuring horizontal forehead lines. Deeper facial fat was grafted over the bone rim under the eye thereby softening the lower eyelid cheek junction margin. The entire midface soft tissue was elevated using a subperiosteal approach where all the tissues are lifted and then reattach to the facial bones at a higher level. This is evident in the increased dental show visible while in facial repose, shortened upper lip and the redistribution of facial fat into a more youthful shape. The incision around the ear is made in an omega shaped fashion so that facial beard growth does not occur directly over the ear and the scar is almost invisible even with shorter hairstyles or male pattern baldness. This natural younger look is important for male executives wanting to stay competitive in today’s job market. These after photos were taken 2 years after the surgery which proves the results are lasting not fleeting. 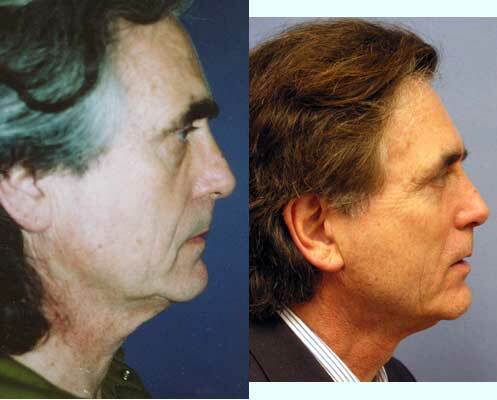 Facelift Necklift Suberiosteal Facelift plastic surgery can enhance your appearance and your self confidence. Realistic expectations are important to be happy with any surgery. As each patient is an individual, different results can be expected in each patient. In severe cases of facial aging with deep nasolabial folds and marionette lines and large platysmal bands in the front of the neck there is no alternative to classical facelift surgery. For milder cases that are more options everyday. Currently the most popular alternatives are radiofrequency treatments like Thermi and Inmode. These require multiple treatments over a number of weeks without any downtime and can be combined with fat grafting or dermal filler injections. Although they can improve things they are not equivalent or a substitute for surgery and most certainly not an alternative to subperiosteal facelift. The risks after subperiosteal facelift are the same as those after standard facelift but since it is a more aggressive surgery the possibility is greater that a risk will occur especially to the muscles and nerves. The benefits are a younger looking you. Some patients look 10 or 20 years younger after surgery especially after the subperiosteal approach. The head is kept elevated, no lying flat or head down position, for 1 week. You should not even bend over to tie shoe laces. You cannot do vigorous or strenuous physical activity for 2 weeks, even jogging at 1 week can cause a problem. You should not keep your neck in an overly flexed or extended position for 3 weeks. Most of the bruising resolves in 2 to 3 weeks. However swelling takes longer to resolve after subperiosteal facelift. It takes about 4 weeks for the muscles to begin to reattach so swelling does not resolve until 4 to 6 weeks after surgery. Normal activities & work may be resumed within 6 to 8 weeks after a subperiosteal lift.